“My normal day-to-day role is focused around helping Computer Science students and staff make the most of the computing facilities that are available here. But recently I swapped my mouse and keyboard for an oral dropper and a pocket full of balloons, and headed for India to help with the efforts to eradicate Polio there. Rotary Internation has been working on eliminating Polio worldwide for over 30 years, in cooperation with the WHO, UNICEF and the US Centre for Disease Control. Significant progress was made on this throughout the 1980s and 1990s, and the last recorded incident of a child being paralysed by the wild virus in Europe was in 1998. However a handful of counties – notably Afghanistan, Pakistan, India and Nigeria – proved much tougher, with the number of cases remaining stubbornly high. 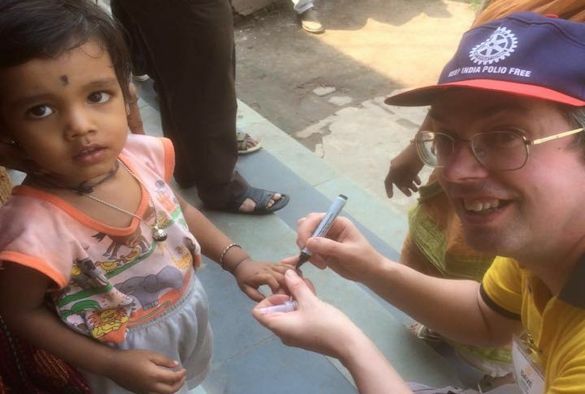 For several years, a group of Rotarians from the UK and Ireland have been travelling to India in November and February, to help with government-run National Immunisation Days – a concerted effort to immunise every child under the age of 5, all 170 million of them! Most of the work is done by local health workers, but they’ve found that the appearance of European visitors helps to bring out the local community – curious to see these strange western faces, and their bright yellow T-shirts. Immunisation boothes are set up all all round the county – at schools and health clinics, outside temples and mosques, in affluent areas and tented slums. (This year there was even a booth in a local zoo). Children receive two drops of vaccine, and are then marked on the finger with a purple pen, to show that they have been immunized. No medical expertise or training is required – and even a geek like me can manage it! This one-day blitz is then followed by a week of “mop up” teams, working door-to-door and visiting homes again and again to ensure that no child has been missed. This was my third trip – the first coming in 2011, which also marked one year since the last case of wild polio in India. Since then, India has managed to successfully keep the disease at bay, and it also appears to have disappeared from Nigeria. In fact, there have been no incidents of wild Polio in the whole of Africa for nearly two years. And even in Afghanistan and Pakistan – the last remaining strongholds of the disease – the number of cases in 2015 was barely one fifth of the year before, and this year looks like being lower still.